Sport, and particularly AFL, is a massive part of our nation’s psyche. The narrative surrounding football draws on those typically (white) Australian values of a fair go, mateship, the underdog, and physical prowess. There’s also an idea that football is a level playing field: regardless of race, if you are good enough you’ll be out on the park. While it’s not that simple in practice, this myth goes to the heart of Australians’ love of the game. Footy, then, creates the perfect backdrop for a play about race relations in contemporary Australia. Banned, written by emerging playwright Barbara Hostalek and brought to life by director Hellie Turner, is set in the aftermath of an incident that took place in the stands at a football game. We find highly strung Jane (Holly Jones) and down-to-earth Meeka (Della Rae Morrison) in a room with mediator Connor (Kingsley Judd) and quickly discover that Meeka, an Aboriginal woman, has assaulted Jane, a white woman, and her family. A court has found her guilty and ordered a lifetime ban on Meeka attending football matches in Australia – this mediation is an attempt on her part to get the ban lifted. Jane, on the other hand, is out for blood. Beginning the performance cool and collected, Jane’s antagonism towards both Meeka and the situation they find themselves in is comical. All pursed lips and clenched fists, the ease with which racist comments roll off Jane’s tongue is jarring. But through subtle yet expressive movements, Jones reveals that her character’s strength is a thinly veiled illusion; she presents Jane as both a bully and a victim. Before the opening night show commenced, we were advised that Morrison was struggling to speak, due to illness. Taking this challenge in her stride, Morrison delivered a flawless performance as the headstrong Meeka. As the work progresses, it’s clear there is more at play between the two women than meets the eye. Layer by layer, their lives are illuminated: their struggles, their passions, their anxieties and their desires. Banned is emerging playwright Barbara Hostalek’s first produced play, and what a way to start! The writing is brilliant, with equal parts comedy and drama plus plenty of food for thought. 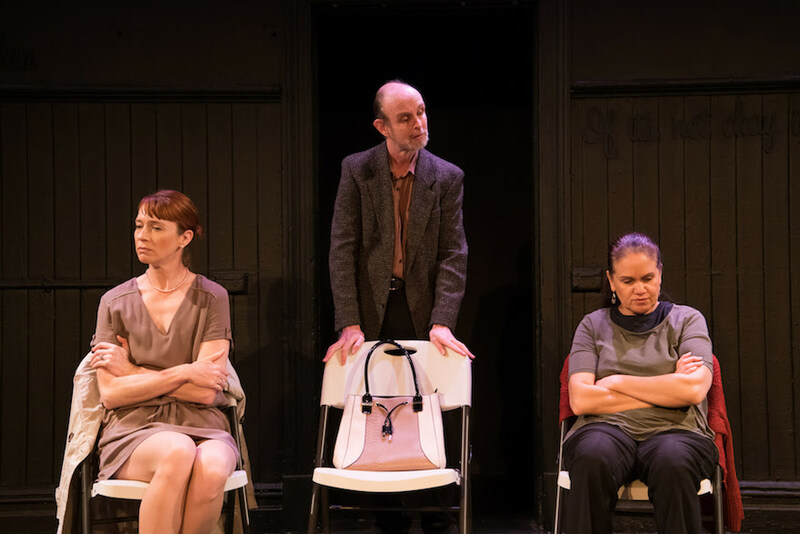 The single criticism I have of the work is that some of Connor’s remarks – designed to stress the fact that the play is about women – are clunky. It is enough that the piece explores the characters’ gender through their own dialogue and discussions about motherhood. The (male) mediator’s declaration that he hopes the women can show men how to deal with conflict, for example, is reductive in a work that genuinely scrutinises the female experience in Australian society. Banned is about women: we don’t need a man to say so. But above all, Hostalek’s script is genuine and believable. The voices she gives the two women are unsurprising without being clichéd. Go for the powerful performances – you’ll leave with plenty to think about. Banned plays the Blue Room Theatre, until 14 July. This review was first published on SeeSaw and appears on Noted with kind permission from Nina Levy.